The upstream portion of the Pomeroy Parking Lot in its current state. A rendering of what the area would look like following construction. (Work is not shown to scale). The white area on the map shows the parking lot area where work is to be done, with the blue area being the second already certified area. 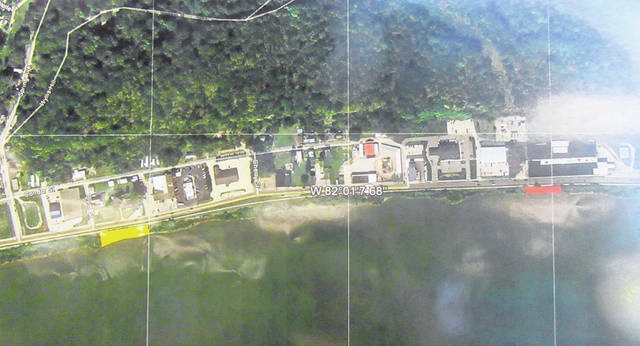 Both the red and yellow areas are where work is proposed to take place once the properties are certified. Chris Carson, project manager, speaks during the public meeting on Thursday evening. 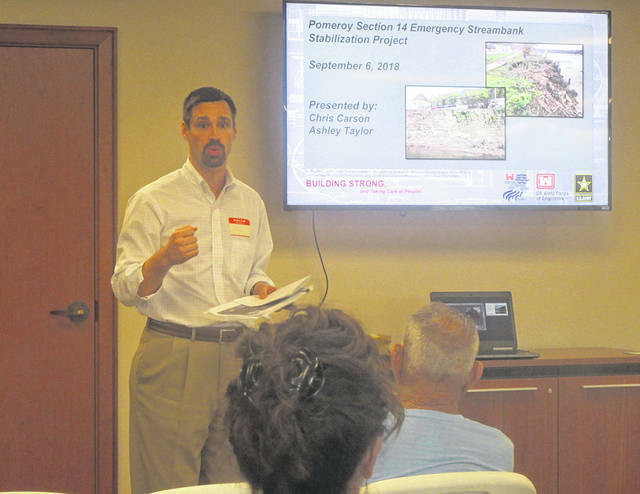 POMEROY — The impact to the historic downtown Pomeroy area with regard to the upcoming streambank stabilization project was discussed during a public meeting on Thursday evening. Representatives from the U.S. Army Corps of Engineers Huntington District hosted more than two dozen business owners and community members for discussion of the upcoming project and ideas to mitigate the loss of the look of the parking lot wall in the historic district. Ashley Taylor, archeologist with the Huntington District, stated that her role in the project is to work with the parameters set by the National Historic Preservation Act. Part of that is holding a public meeting to hear for those in the area about how they would like to see the work completed. The proposal for the area in front of the parking lot is for there to be a three foot sandstone parapet wall at the top of the wall using the current sandstone, with limestone then used the remainder of the way down the wall. 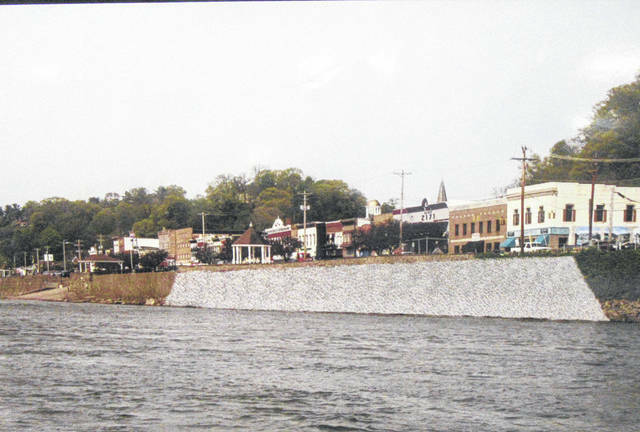 The limestone would be placed against the current wall and grouted to it in order to stabilize the upstream area of the parking lot. The parapet wall will allow for those standing in the parking lot and downtown area to notice no change in the view. The look would be different from the river or from Mason, West Virginia, with the limestone a different color and texture than the current sandstone. While work will be taking place to stabilize the parking lot, the focus of the project is the stabilization of the streambank as it relates to State Route 833. A feasibility study was conducted in 2017 to set the scope of the project, but the flooding in early 2018 resulted in additional damage to the streambank, therefore changing the scope of the project. Chris Carson, project manager, explained that the focus is now on the four areas at which State Route 833 is the most endangered. 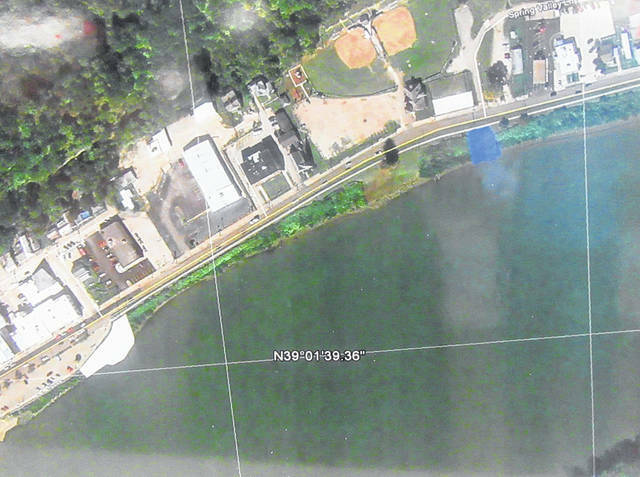 Those areas include the upstream portion of the parking lot near Rite Aid, the riverbank near Francis Florist, an area just upstream from Village Hall and an area near Plum Street. Carson explained that the current plan is to move forward with the Parking Lot and the area near Francis Florist as those properties have been certified to be village property and therefore can be accessed by construction crews. The other two properties are being looked into in order to certify those areas for the construction work as well. 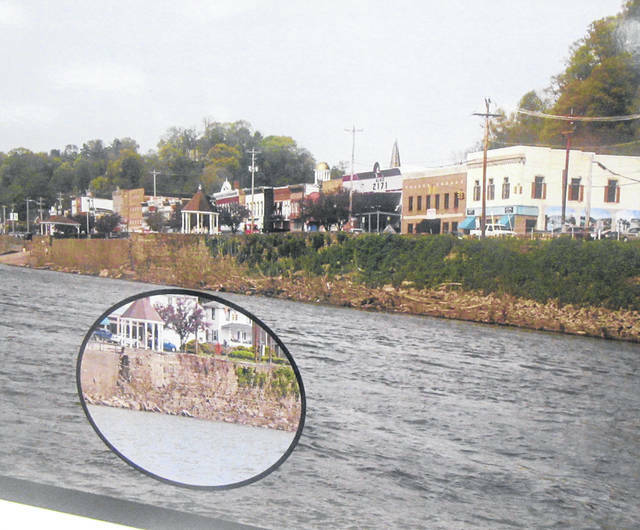 Under the current plan, once the areas are completed, the streambank will resemble other projects completed in the region, including the stabilization which took place in Minersville several years ago. Mayor Don Anderson explained that in addition to the streambank work being completed in partnership with the Army Corps of Engineers, the village will be responsible for the filling of the voids under the actual parking lot and is looking into how much fill material is needed. Asked about the change to the project following the flooding, Carson and Anderson noted that they are continuing on the original budget although the project has changed. Federal money which is being used, in addition to the village share and grant funds, is from a highly competitive line-item in the federal budget with only $8 million available nationwide each year. Had the involved agencies went back to ask for additional funding there was the chance that they could have lost the original funding, said Anderson. “It may make it through another flood season, might not,” said Anderson of the roadway and parking lot in the most endangered areas. Anderson added that he felt the roadway and parking lot in its current condition may not make it through another flood season. All of the work will take place from the river with a floating construction area to be brought in for the project. Depending on the number of crews working on the project, each area is estimated to take two to four months to complete. Carson stated that the goal is to have a contract awarded on or before Sept. 26.